This should have been a hearty, flavorful, savory meal...hearty and savory it was, but the amount of flavor was a little questionable. Portobello mushrooms, green onions, spinach, pine nuts, and garlic are sauteed and seasoned to taste with salt and pepper. I suggest you season liberally here, as the spinach (which seems to be the dominant flavor) is rather bland on its own. This mixture is then set atop a thick slice of "country" bread (I used a French bread loaf), and then sprinkled with yummy, salty, "meaty" smoked mozzarella. 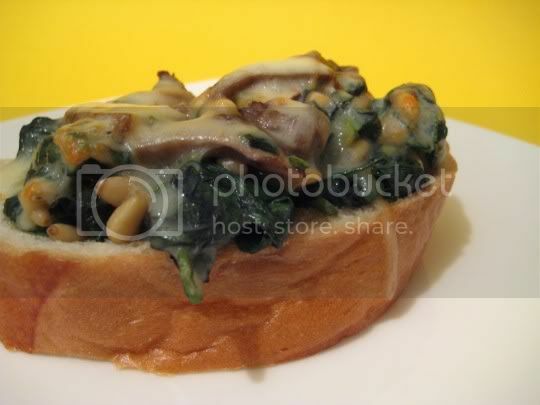 Be careful when topping the bread slices: the spinach mixture is very wet, and it would be best to drain it first. Similarly, I would suggest lightly toasting the bread first, otherwise you risk it getting soggy. The open-faced sandwiches are then baked until crispy and the cheese is all melty and gooey...and it's this cheese that unfortunately gives the sandwich most of its flavor. Of course, these are best served right away, although I suppose any leftover mixture could be refrigerated and used to create sandwiches the next day. Make again? Maybe, but some drastic improvements need to be made...such as more seasoning! LOL, well I love spinach...mushrooms not so much. So I'm always amazed when I make a dish with mushrooms that comes out fantastic. But you've discovered my food fetish...cheese, o glorious cheese! Anyway, I'd love to hear how yours comes out!